With 310-DUMP's fully stocked inventory of front load dumpsters, we offer options appropriate for your business. Give us a call or request a quote online. A waste management consultant will call you to discuss your needs and provide you with an assessment. We will suggest a program tailored to your company's needs. Upon agreement, we'll set your company up with front load dumpsters and a pick-up plan. The program can start immediately. You can count on us to pick up on time and on schedule. Designed for a more permanent waste management solution, front load dumpsters are commonly used by commercial and industrial facilities for regular trash pick-up, rather than one-time disposal. Front load dumpsters are fire resistant, leakproof and available in a variety of sizes. 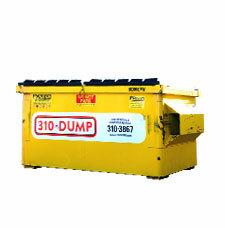 310-DUMP offers a variety of standard flat or sloped top front load dumpsters for commercial businesses (including restaurants, retailers and corporate clients) & industrial users who require regularly scheduled waste collection services (daily, weekly or monthly). Metal or Plastic. Both will provide additional security and help keep out pests. Front load recycling bins are ideal for businesses that generate a large amount of cardboard containers or boxes on a daily, weekly or monthly basis. A locking lid and an easy access front slot for flattened cardboard insertion is standard. At every waste pick-up, your bins will be inspected by professional, courteous drivers. All maintenance issues will be reported to our field service technicians who will promptly fix or replace the bin. This assures no-hassle, worry free, scheduled & on-call waste collection. If your volume changes, we can change your pickup schedule or the size of your bin. Call on 310-DUMP the next time you need a Front-Load Commercial Dumpster.